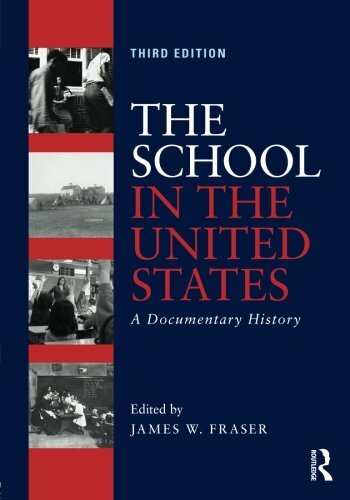 The School in the United States collects the essential primary documents of the history of education in the United States, from Colonial America to present-day reform efforts. Expertly chosen by historian and education scholar James Fraser, these documents incorporate a wide range of sources, from first-person accounts to textbook excerpts and presidential speeches. As Fraser demonstrates, the history of American education is also a history of national debates and decisions about schooling, and he places the prominent voices of these debates in conversation through carefully curated selections, including the work of famous thinkers like Thomas Jefferson and W.E.B. Dubois, as well as that of ordinary classroom teachers. Organized by era, each chapter begins with a brief introduction intended to spark student interest, while a detailed bibliography suggests opportunities for further research. The School in the United States is comprehensive enough to be used as a main text, but selective enough to be used alongside another while making key readings in the history of American education accessible in a format that encourages students to make their own evaluations as they engage with major historical debates. • Additional materials on current educational issues including the Common Core State Standards, educational philanthropy, and increased school privatization and vouchers. • Online resources that include a full Instructor’s Manual and sample syllabi,available at www.routledge.com/books/details/9780415832472.